The first of the 21 advanced trainer aircraft for the French Air Force has successfully completed its first flight. July 10, 2017 - According to Defen's Aereo the first Pilatus PC-21 (serial number 293, immatriculation 709-CF) of the Armée de l'Air (French Air Force), unveiled in May, made its first flight after a series of ground tests at the end of June. After the first flight, a second exit was conducted on July 13 at the presence of a French delegation composed of members of the French Air Force and of the French Ministry of Defense. To date, at least four French PC-21s are currently in the final assembly line at the plant located in the center of Switzerland, in the town of Stans (Nidvaldo). The first aircraft should be delivered from 2018 and will be assigned to Cognac Air Base BA709 where the young fighter pilots will receive part of their training. The contract, valid for a period of 11 years, was signed on December 2016 between the British company Babcock Mission Critical Services France (BMCSF) and Dassault Aviation (More details here), which will be responsible for the on-line delivery of these aircraft and will provide technical support for French pilots. The PC-21 should replace the Alpha Jet fleet based on Tours that have an avionics obsolete compared to that in the 4th and 5th generation fighters, including the Rafale. 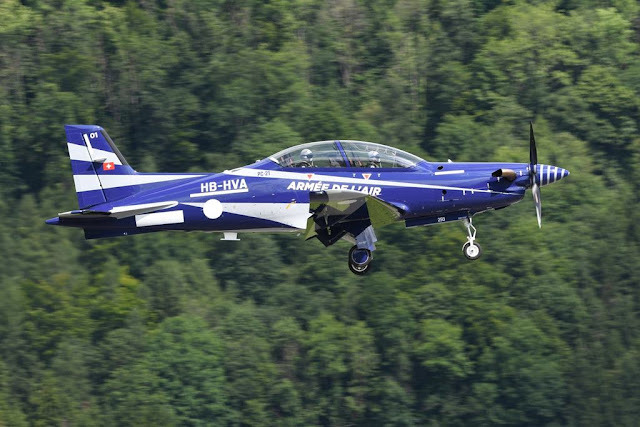 According to Pilatus Aircraft Ltd the PC-21 was developed and certified as a completely new training system with the objective of meeting the expectations of modern air forces over the next 30 years, both in terms of capability and life-cycle cost. The PC-21 has a superior aerodynamic performance when compared with any other turboprop trainer on the market, a more powerful, flexible and cost-effective integrated training system than any other jet or turboprop trainer and a life-cycle support cost equal to current turboprop benchmarks. Its roles included Basic Flying Training, Advanced Flying Training, Full Mission Management Training, Embedded Simulation and Emulation.